Wes Horn’s modification of an old planter box in front of the movie theatre, California Bench, is a tribute to the State of California’s Flag, which originated in 1911 and was at that time the California Republic Flag. It is clearly seen on the upper back portion of the bench, with the star, grizzly and wording on and around the artwork. 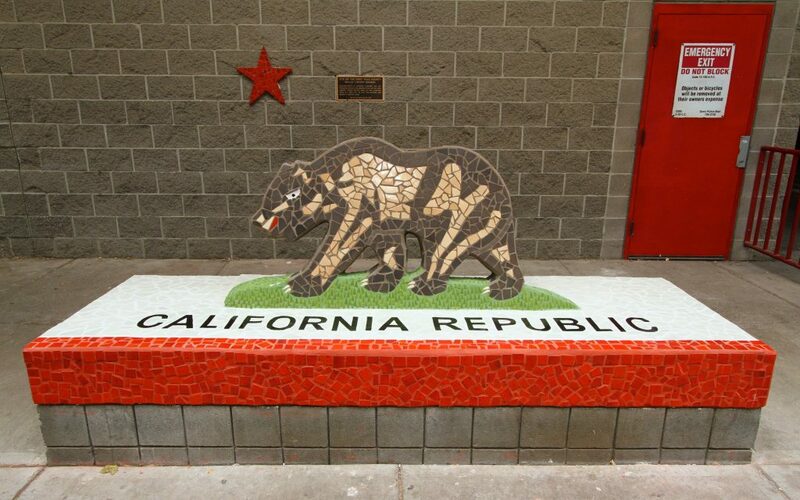 As Horn believes in symbolism he finds that his love of California and Californian history is translated in this sculpture through the massive bear which appears to be moving along the bench and the star tile on the building behind it assists and creates the look of a three-dimensional flag. The grizzly bear in the original 1911 flag design was supposedly developed from the last know grizzly in captivity at the time. The grizzly, who was given the name of Monarch, passed away at the Golden Gate Park in San Francisco, California, in 1911.